As early as the first century A.D., Western cartographers and geographers began to speculate that there must be a large continent in the southern hemisphere, to act as a counterbalance to the large known landmasses of the north. Beginning with Magellan, explorers sailed out into the vast expanse of the Pacific hoping to find and claim this mythic Southern Continent in the name of their king, church, or trading empire. Facsimile of chart from the Dieppe maps series, showing Jave La Grande’s east coast (1547). Image courtesy of the National Library of Australia. 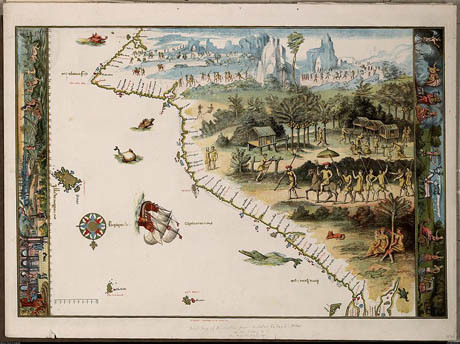 “Jave La Grande” has been used as evidence for the controversial and largely discredited theory that the Portuguese discovered and mapped part of Australia’s coastline two hundred years before Captain Cook, and kept their discoveries secret so as not to breach the terms of the Treaty of Tordesillas. The map also shows the rich mythic inheritance of Terra Australis, fueled by centuries of geographic speculation. 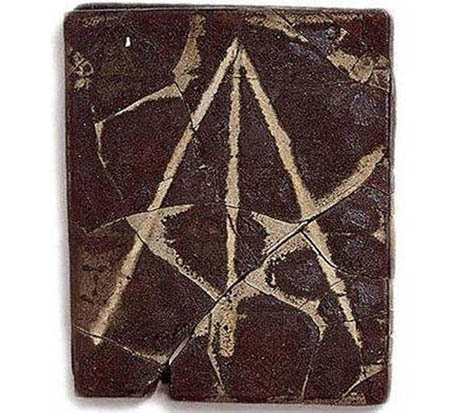 So why did it take more than three centuries of near misses and brief landings before the First Fleet arrived in Botany Bay, and European colonization of the Australian continent began? Early reports of “wild, black, cruel savages” and a barren (to Western eyes) landscape (“There is neither Herb, Pulse, nor any sort of Grain […] to eat,” complained William Dampier) were not exactly encouraging. Meanwhile, until John Harrison claimed the Longitude Prize in 1762, with a chronometer capable of keeping time accurately over long sea voyages, explorers could never be quite sure where they were. Mistakes of a thousand miles or more were not uncommon, particularly because any errors in guesswork would compound disastrously over voyages of many months. Kenneth J. Carpenter, Nobel-prize-winning nutritional scientist and author of The History of Scurvy and Vitamin C, has estimated that between 1500 and 1700 some two million sailors died of scurvy, making it the most lethal food deficiency disease in recorded history (excepting famine, of course). For seventeenth-century explorers faced with only ten to twelve weeks before sailors began to sicken, and no firm understanding of scurvy’s causes and cure, Australia was a nutritionally impossible destination. 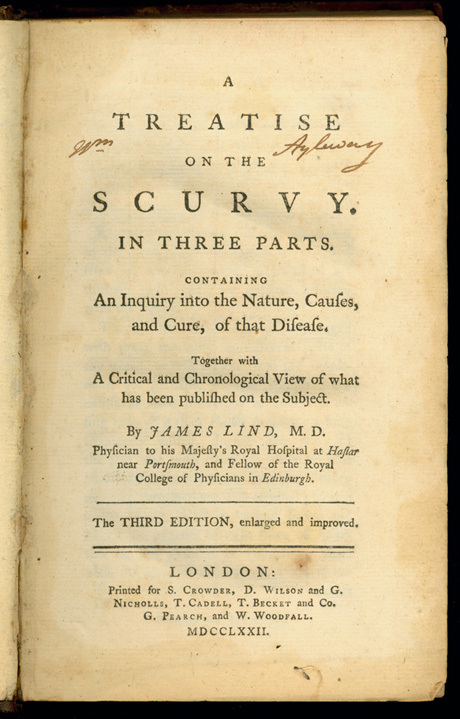 Dr. James Lind‘s 1753 Treatise on Scurvy, which recommended a daily dose of citrus juice as a cure. Image courtesy of the Claude Moore Health Sciences Library at the University of Virginia. Physicians speculated that scurvy was caused by a salty diet, by melancholic nostalgia for dry land, by a lack of oxygen in the body, which thickened the blood, by foul air and damp, or by a lack of activity, depending on which medical theories currently prevailed. It wasn’t until the 1930s that scientists isolated hexuronic acid, named it Vitamin C, and proved that a deficiency of it caused scurvy. Nonetheless, most eighteenth-century navigators were aware that once scurvy victims reached shore they could recover by eating fresh fruit and vegetables. However, the difficulty remained: without refrigeration, ships ran out of fresh produce from home within a couple of weeks; and even when they stopped at foreign ports to take on supplies, sailors often didn’t recognise native plants as food. A 200-year-old block of British Navy Portable Soup, image courtesy of The National Maritime Museum. 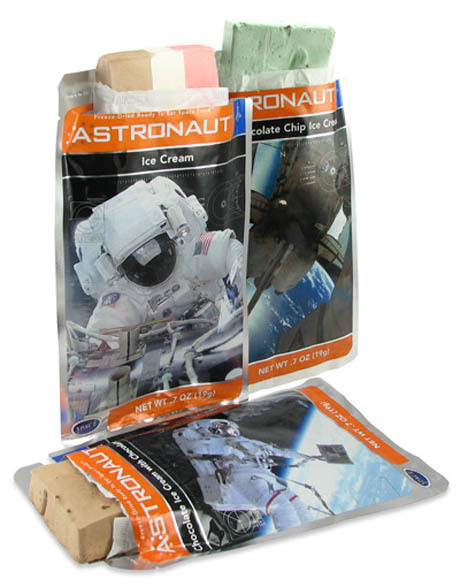 Freeze-dried astronaut ice-cream, available for purchase online here. Amazingly, nutritional barriers to exploration still exist, despite the wonder that is astronaut ice-cream. At NASA, the awe-inspiringly named Human Adaptation and Countermeasures Division works on developing everything from radiation-resistant food packaging to specific strains of microalgae high in essential fatty acids. The food-related challenges of space travel are enormous: astronauts on long missions suffer from reduced bone mass, muscle-wasting, UV radiation, and jaded palates (the Space Food Systems Lab first sent condiments into space in the 1990s). In Houston, NASA keeps a KC-135 airplane, the Vomit Comet, where scientists can test the effects of microgravity on food prototypes. 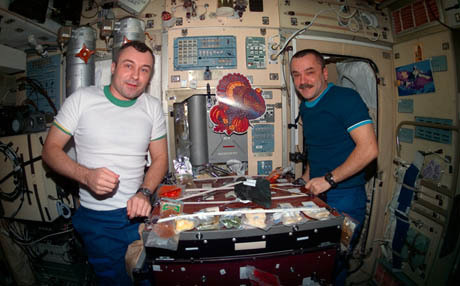 A Thanksgiving meal aboard the International Space Station. Image courtesy of NASA’s Space Food Systems Lab. A separate unit, the Advanced Food Technology team headed by NASA’s Dr. Michele Perchonok, are responsible for developing food systems for long duration missions, such as the five years it would take to reach Mars. Their research projects include bio-engineering crops to produce raw ingredients and recycle carbon dioxide in flight, as well as extending the shelf life and reducing the packaging of existing space food solutions. [This tool] will be able to make items like pasta or breakfast cereal. It also will be able to expel oil from items, such as peanuts, very simply, with just a little bit of pressure. And the last thing, it will be able to mill the wheat into flour. So, by taking one piece of equipment and maybe changing a part or two, you’ve now made a very versatile piece of equipment that won’t take up as much mass and volume. These “mission scenarios,” says NASA, “present challenges beyond conventional knowledge concerning food” – meaning that, for now, Mars is our Australia: a nutritionally inaccessible destination. If only they’d had Vegemite! thought-provoking as always! A bit tangentially, I’m reminded of a name I encountered in this morning’s reading: Bill Mitchell, the inventor of Tang (that semi-apocryphal astronautic beverage) as well as Cool-Whip and Jell-O. (One wonders: how did Tang escape hyphenation? Why not Tang-eroo, or Tang-utan?) To make an architectural connection, it turns out that Mitchell helped to build the infamous Petrified Wood gas station in Lamar, CO, which Ripley’s incorrectly called the oldest building in the world. I’m tempted to thread the connections: fossilized organisms suggesting the possibility of imperishable foods, voyages in time evoking voyages of discovery… well, I admit the thread frays.